This project was a full reconstruction of a highly complex and unique streetscape and a continuation of work previously done on Wetaskiwin’s main street. 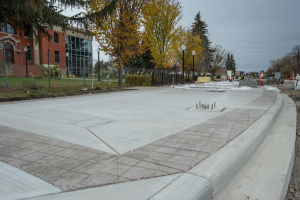 Work consisted of excavation, storm sewer and water line replacement, full electrical replacement, cement stabilization, granular base course, regular and decorative concrete, and paving. The project began with full removal of all existing concrete and asphalt. Existing water and sewer lines were removed and replaced. Lead services from older homes were removed and replaced. New electrical was run throughout entire jobsite in order to accommodate all new decorative and street lighting. After exposing the subgrade it was found that it was extremely soft requiring WSP and Carmacks to move forward with cement stabilization on top of design structure. Decorative stamped/colored concrete runs throughout entire job. A red brick pattern in .5M strips surrounds multiple tree-pits sitting on concrete grade beams that are finished with quality masonry work and topped with a limestone cap-stone. 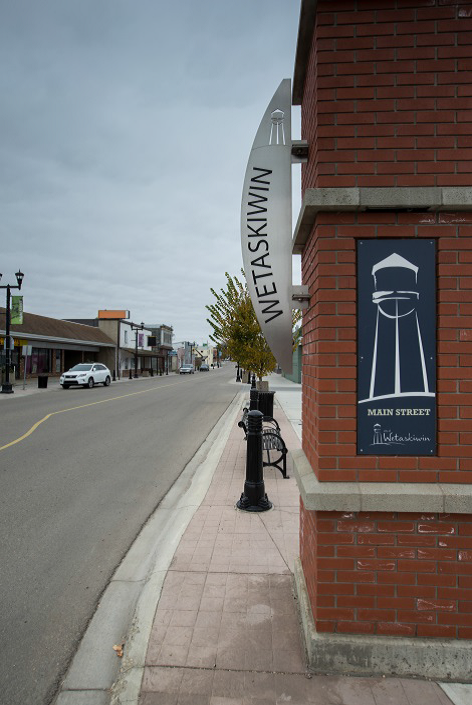 The walk in front of Wetaskiwin City Hall is finished with decorative sandblasted images which were designed by the City to highlight its culture and values. The City incorporated a traffic circle in front of City Hall which draws attention to a focal point highlighting a Wetaskiwin Art Program center piece. Initially the traffic circle was not well received by residents who felt it was not needed and that it would create traffic problems; however, since completion, we have received many compliments about the ease of use and beautiful look. The center piece features large brick chevron signs, red brick colored concrete patterns and is heavily reinforced for truck traffic and decorative lighting. Although construction started late into the season (roughly June 20, 2016) the project, including extra work, was 95% complete by the end of October.